The circular economy is Europe's next big thing, with a potential to bring major growth in the recycling and re-use industries. Circular economy is more than just straight-forward recycling. It is the acceptance and, moreover, the implementation of the business model in which products are designed to be stripped down to their smallest components after they've been used, with the parts re-inserted into the production chain instead of being discarded. This business model, known as Extended Producer Responsibility (EPR), forms an integral part of Malta’s Waste Management Plan 2014-2020 and is the business model practised in Malta by which recycling of end-of-life goods, such as electrical and electronic goods (WEEE), packaging, batteries, cars and other products are broken down to renter the production chain as raw materials. 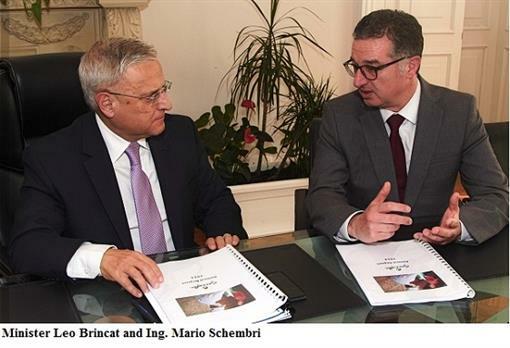 The circular economy in Europe and Malta was the subject of a meeting held recently between the Minister for Sustainable Development, Environment and Climate Change, Mr Leo Brincat and a Director of the Brussels based EPR Alliance (EXPRA), Ing Mario Schembri. “Whilst acknowledging that more needs to be done in order to further increase recycling, we are looking forward with optimism as public participation continues to grow,” said Minister Brincat. Latest figures show that, during 2014, GreenPak have collected 53% more recyclable materials than in 2013, diverting these amounts away from landfills. Through GreenPak, a MEPA-approved and authorised compliance scheme for the recovery of packaging waste in Malta, Local Councils have last year been collecting recyclable materials at an average rate of 48.2kg per capita as compared to 39.8kg per capita in 2013. These data comes out of GreenPak’s 2014 Annual Report, a copy of which was presented to the Minister. These waste materials are collected through the weekly door-to-door collection commonly known as “Recycling Tuesdays”, the kerb-side glass collection held on the first Friday of each month, and from the Bring-In-Sites for separate waste located in the 40 localities linked to GreenPak. All these collections have resulted in an increase of 64% in paper, 45% in plastics, 37% in glass, and 55% in metal recyclable materials. “More people are becoming conscious of the substantial contribution GreenPak is making in the collection of packaging waste. This success is the result of the adoption of the EPR business model by which GreenPak brings together Local Councils, the community and private-enterprise all working together towards the circular economy. Since 2006, GreenPak has diverted thousands of tonnes of packaging waste away from landfills and towards recycling. The facts are that for a number of consecutive years, GreenPak has surpassed the minimum national quotas of 60% recovery of packing materials” said Ing. Mario Schembri. “It is most encouraging to note the improvement in public participation as these results show. I am well aware of the benefit of the educational campaigns being run by private-enterprise led initiatives among residents and the results being achieved. We augur that the public continues to participate in these initiatives and achieve higher recycling results to continue fuelling our circular economy and the creation of new jobs and business opportunities,” said Minister Brincat.